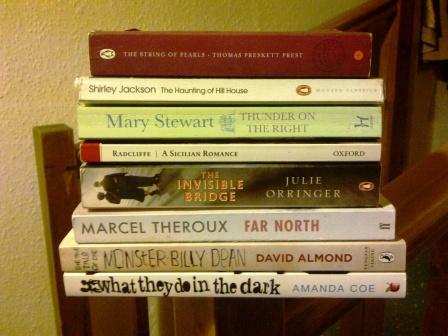 In the last couple of weeks I have picked up and started far too many books, and so this is a name and shame post. I have rounded them up from different corners of the house, and I will finish at least two books for every one I start until the number in progress is more sensible. Usually I aim for three: an upstairs book, a downstairs book and a travelling book. I hadn’t meant to start this one yet, but I pulled it out of the bookcase for this year’s RIP Challenge and when I opened it to take a look I was hooked. This wasn’t on my RIP list, but when it appeared in the library I had to bring it home and I had to start reading right away. My problem is that it isn’t a daytime book, it’s too unsettling to read late at night, and so I have a very narrow reading window each evening. Now this one I have actually finished since I took the picture, and I am pleased to report that it was a wonderful entertainment. This caught my eye in the library and when I came home I just had to pull my copy out. I’ve been reading this one on and off for months. Well it is a big book! I picked this up from my Clearing The Decks stacks a while back, and I read a good bit sitting in the park while Briar was on squirrel watch. I was distracted by another book, but I must get back to this one and see how it all ends. I was just getting to grips with the naive speech and phonetic spelling when this one disappeared under last Sunday’s papers. By the time it reemerged I was engrossed in something else. Now this is a strange one. Wonderful characterisation and wonderful writing, but it isn’t quite coming together. I must push on, because there is so much potential there. And do you have a cure for startitis?! Yes I have heard of that illness. I am at risk, because I have many great books on hand, and this post is an attempt to keep it at bay! I usually have 6 books going at once; I read in a loose rotation, though, so none of them get ignored. One’s an audiobook, two are nonfiction, two are whatever kind of fiction I feel like, and one’s a classic (that’s the newest addition to the rotation, since I decided I wanted to read more old books!). It works for me, because I like having variety…I recently tried a spell of just reading one book at a time, but I ended up reading less because if I wasn’t in the mood for that style of writing, I ended up not reading at all! Of course, if one book really grabs me, I’ll happily read it straight through. 🙂 And when fibro brain attacks I usually switch to one ‘comfort’ read, since it’s all my mind can keep straight. About 11 years ago I could read three books at the same time, but not any longer. I start one and stay with it til I’m done. I am boring. I read one book at a time. I never, ever vary from that! I always read a few books at a time, but right now I’m struggling with too many books too. Started Gaiman’s Fragile Things for the RIP challenge (I also started another for the challenge, but decided to put it down after one [amazing] page), House of Leaves for RIP, The Immortal Life of Henrietta Lacks for 1book140, Anil’s Ghost for my bus book…not to mention the countless books I want to read but am resisting, the story collections I halfway abandoned months or weeks ago, all the reviews I have to write…ack! I’d like to get my reading down to two or three books, good luck with yours! Thinking seriously about this, I have 4 started which 2 of which I have not dipped into for months if not years! So why do they still sit there with their bookmarks in winking at me? The other 2, one on my kindle is handy if I am stuck anywhere and the other one is annoying and I can only dip in and out of. I might start a book and then another but generally I then finish one and then the other but they have to be books which are vastly different as I can get a bit confused between stories on occasions. If I have too many on the go I admit to feeling like panic is setting in – who knows why as no one has made me start all these books! usually just one, but when I read a short-story-collection, I mostly start reading a ‘normal’ book as well. I find it hard to read a new story when I just finished one. I have to process stuff. that’s why I read a bit of a novel when I feel I can’t start with another story just yet. I love the idea of a book upstairs, downstairs & for travelling. Most of the time I’m a read one book at a time person, unless I’m reading non fiction and then I’ll have a fiction on the go too. I live with a person who is annoyed if he catches me reading and the house is in a mess (normal) and there is no food on the table when he arrives home from work (not quite so normal)! Consequently I have hidden caches of partly read books all over the house! I got caught out when the old sofa was replaced with a new one and they found seven books stuffed under it! Whoops! I blogged today that I use a random number generator to choose my next read, otherwise I’d still be trying to choose or have too many partially read books. I used to have an upstairs, downstairs, in the car, and in the basement book to read, as you do, but I’ve given that up as I began to get the book plots mixed up. Hope you try a RNG and see if that works! By the way, Mary Stewart has long been one of my favorite authors. I just go where the books take me as choices are limited. I hate to “not finish” and push myself to finish a book. Having two or three books around is I think interesting. I very rarely read more than one book at a time because I need to fully concentrate on what I am reading if I’m going to enjoy it. That said I am reading Annabel by Kathleen Winter and Jayne Eyre at the moment. One is on a kindle the other hardback which I think is how I ended up reading the two. I’m loving both though so having no probs getting past the first pages. Whenever I have startitis I think the best thing to do is to pick up a book that is totally different to what you would usually read and then go back to the other books when your in that mood again. That’s what I do anyway. Sometimes I just need a change of pace to keep me interested. I usually have several books on the go and periodically need to set myself to task to tidy the stack. It’s not just reading mood that governs the selection — though mostly — it’s also superficial features, whether one is too awkward to carry about, or whether one requires a dictionary at hand (too heavy for travelling)…I can think of countless reasons to start another book. Glad to hear that I’m not alone. Ah but, ah but … I wonder if anyone else attempts to ‘match’ their bookmarks to their books? I am currently reading the latest Rachel Hore novel, A Gathering Storm. The cover has the now ubiquitous gates which usually lead to a garden, but in this case they lead to a sea view. I recently visited a NT property with a very similar sea view and have printed my photo of that to use as a bookmark … why I go to this trouble I do not know, but I do enjoy having the ‘right’ bookmark, in colour or style, or both, for the book(s) I’m currently reading. Barmy, or what! I don’t think I could cope with that many at once. Usually I have just one,very occasionally two, plus something classic ongoing on my Kindle. I try to be serially monogamous with my reading!